If you love trading Ladders then you should learn how to trade a Short Call Ladder Strategy (or Short Put Ladder that I will discuss in my next post). The reason is that they have limited risk, unlimited profits potential (only on paper) – in reality Short Call Ladder is not a good strategy. We will shortly know why. On paper they are better than Long Ladders because of the limited risk and unlimited profits – but unfortunately though limited, the risk is just too much on the Short Call Ladder and getting unlimited profits is difficult. Therefore you should know this strategy to actually avoid trading this. Still I highly recommend you read this article to enhance your knowledge. I don’t have a problem with too much limited risk if the risk can be managed. However, with Short Call Ladder the only option is to take a stop loss if the risk increases beyond comfort level. Interestingly even that cannot be done as the stock has to travel from the worst zone to the best zone. If you don’t know whether the stock will be in the best zone a few days from now or on expiry day – how can you even take a stop loss when the stock is in the worst zone? If you did not understand what I just said, it’s fine, I will discuss this later as well. How to Trade a Short Call Ladder? The view: If you think Nifty/Stock will move up during the next few days and volatility too will increase, Short Call Ladder is one of the (worst) strategies to play. Note: There are many better strategies to play if your view is bullish. The risk-reward is good in this strategy, but only on paper. You will shortly know why this strategy is not a good bullish play. 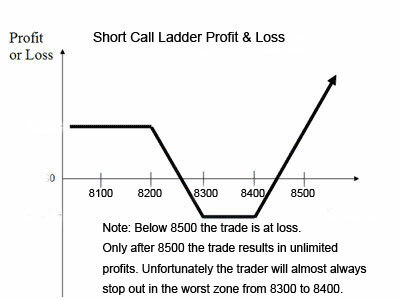 Please Note: In the above graph the trader has received a credit trading the Short Call Ladder. However when I looked for real prices that were given to me as a retail trader, I had to give a credit. In rare occasions you may also get a credit. If you get a credit this trade may be tried, because if the stock falls you will end up keeping the credit. If the stock rises too much, you end up making money. Still this is not a good trade as the credit you may receive will be small and not justify the risk you take. Note: Volatility may drop or rise, we don’t know. But still lets trade this as the results will be shown for the expiry day, so for this paper trade volatility does not matter. Note: Since Nifty is at 8247 we could have traded this with 8100, 8200, & 8300 – with 8200 treated as ATM. In our current trade we are treating 8300 as ATM. 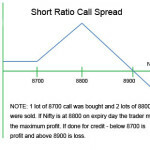 Had I done the trade with 8100-8300 my risk would have increased as I will buy the 8200 and 8300 option – though I will receive more from selling the 8100 option – my total outgoing will be bigger than the current trade. I am not comfortable with putting too much money on risk, but your view may differ. Depending on your comfort level you can always treat slightly In The Money options (ITM) as At The Money (ATM). You can say in that case I should have gone further up to save money. Well you have a valid question, but there is a problem. My risk will increase if I go up. Why will the risk increase? Because Nifty will have to move up significantly to generate profits. Later we will see why a significant move is required. A small movement will still be a loss for a short call ladder done on strikes deep out of the money. The decision to trade which strike price is a VERY important decision for an option trader, especially if the trade involves trading At The Money (ATM) options and when the stock or Index is NOT exactly At The Money (ATM). Liquid options also helps to get a better fill, and make more money in the same effort because the ask and bid are very close. Moreover the results will be almost same. So why take the extra risk? This is not our max risk. We will see soon max risk is too much in this trade. All options expire worthless. The trader loses Rs. 3715.00. Nifty expiring anywhere below 8200 the results will be same. This is our max risk. For selling 100 shares of Nifty almost 55,000 will be blocked. Since buying is for protection, most brokers will not block capital required for 8300, but for 8400 buy almost 10,000 will be blocked. Total margin required: 55000 + 10000 = 65,000. Is this really limited risk? Are you comfortable losing 21% of your capital if wrong in just one trade? At least I am not. I don’t care what profits a trade can make – but if the risk is hard to manage and 21% of my money is at risk – I will not trade such a trade. Period. Note: On expiry if Nifty is anywhere below 8500, the trader still loses. Remember that this trade was initiated when Nifty was at 8247. Even after traveling more than 3% if a bullish trade loses money then it cannot be called a good strategy. Had you done a debit spread you would have made great money by now. With every 100 points up-move the profits will increase by Rs. 10,000.00. The problem as you can now see from the above results is that to get into a profitable zone Nifty will have to travel through the worst zone that is from 8247 to 8500 and then some more to make a decent profit for the trader. In real world the trader will become nervous even if Nifty is climbing up. Why? Because its a long journey for it to travel to hit the profitable zone. In desperation the trader will book a loss somewhere between 8300 and 8400 (the worst zone), never waiting for the real profits to come. This is again a big reason as to why this trade should not be done on deep Out of The Money (OTM) options. Your total money on risk may reduce, but chances of losing money also increases. Here even after a 3% move, the trade is in loss. A deep out of the money trade may be a loser even after a 5% move. Yes, if VIX increases substantially and expiry is a few days away, there is a chance that the trade will be in small profit even in the 8300-8500 zone. But what are the chances for that? Usually VIX decreases when Nifty is going up. This again is negative for this trade. In Short Call Ladder a trader sells one ITM call, and buys one ATM call and one more OTM call. The stock needs a significant move up to realize a profit. Risk-reward is good on paper, bad in real trade because the stock has to travel from a negative zone to a positive zone. The trader will almost always stop out in the negative zone. Avoid this trade, look for better trades when bullish. Do share your experiences of trading a Short Call Ladder or any other ladder strategy. Hi Dilip Sir, Eagerly waited for your post since 11 Dec.Merry Christmas Sir & Happy New Year Sir. Merry Christmas & Happy New Year 2015 to you too. I am a father of two young kids. I have a consulting job and other professional work which demands my time. Somehow I could manage this post. Anyways many thanks for reading and awaiting my posts. Wish you a very happy new year Dilip ! hello Dilip one of my associate recommended this site to me, just went through it i detail, hope you practice what you preach in the course. I am missing a performance tab here to the greater extent!!!!!!! So where can we see your strategies performance for at least last one year????? We don’t need your trades details but one should look at what you made at least with 5lks simulated portfolio month on month. Ramesh nice to hear that people are recommending this website. Very motivating. Thanks for the information. Yes I do trade the conservative strategies only. I have a second account where I have kept some money for research. But in the main account only conservative strategies are traded – be it non-directional or directional. Performance tab. Ramesh do you think the performance reports on most sites are true? If yes why do people lose money trading their tips? Donâ€™t believe me? Pay any site with a great past performance and be ready to lose money. 🙂 Even I lost money with 4 advisory companies. But thanks to them – I started reading options. Remember this – my performance has nothing to do with yours. Look at what you will learn from the course and not how much I am making from my trades. you simulate your strategies you teach in the course with a paper capital of 5lks and post the end figure of each trade by month end, its as simple as that, we as a readers of sites like these have our own way of dealing such data, don’t worry about that! after all we would like to see the execution of what is perched, from the man himself who created the course! All I can say at the moment is that I rarely have a losing month just because I don’t go overboard and I trade very conservatively. However there are some issues with taking out the data. I have a huge trading data. I will have to take out the brokerages that I have used to calculate profit and loss in my trade sheet in both buy and sell. I will have to take out results from the conservative directional trades that I took. Though they are part of my course and I can claim them to be “performance”, but in true sense it is not. Because directional trades are based totally on the view of the trader. He/she can make profits/loss 100% of the times. When I had only one account a lot of research also went into it with real trades – that needs to be taken out to get a fair result month after month. It will be hard for me to remember which of those trades were research. Its huge work and I will see if this is really necessary. Not many traders who call me are bothered with my past performance. Some people do not buy my service because of that. I am OK with that. I am not looking to become a millionaire from this site. On top of that, past performance can never be a guarantee of future performance. Plus I don’t want to “sell” my service to people who only look at my past performance and buy my service. My service is for people willing to learn conservative strategies and work to achieve good returns from their portfolio. People who have taken my course call me and thank me for the strategies. Frankly I am not even comfortable sharing my past performance. Some may think I have one crore in my account and some may calculate it on one lakh. Neither of them are true. It is different from a stock advisory company’s performance. But still if lot of people demand, I may post my past performance.